Municipality throws children with special needs out of their school building in defiance of court ruling issued yesterday. The Bnei Brak municipality has thrown a group of special needs children out of their school in violation of a court ruling, Kikar Hashabbat reported. 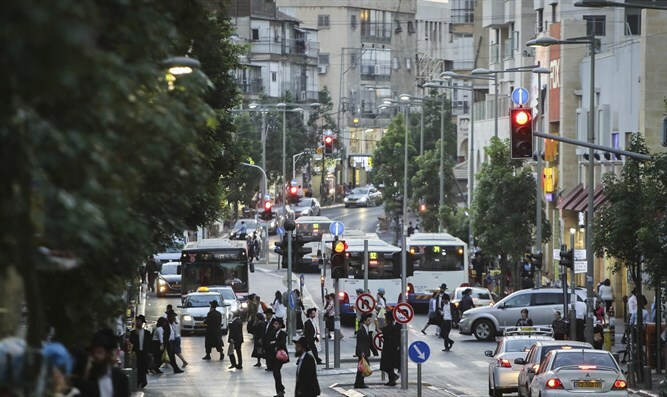 The municipality had decided to relocate two schools belonging to the Ohel Sarah organization, which includes children with disabilities, to different buildings so that a Lithuanian-style haredi school could open in the building they currently occupy. Parents of the students of the Beit Shai school, where boys between the ages of 13-21 learn, and of the Beit Chinuch school, where boys learn up until the age of 13, protested the municipality's decision. According to the parents, the new building can only accommodate 10 classrooms, nowhere near enough to serve both schools and the students with special needs. On Wednesday, the court ruled against the municipality and ordered that the Beit Shai school remain at its current location. The court allowed the municipality to relocate the Beit Chinuch school. On Thursday, the Municipality decided to cancel the court's decision. Inspectors from the municipality were sent to physically remove the children from the building on Kishon Street. The children were brought out onto the street and the school was locked with iron chains. One of the mothers, M., complained to Kikar Hashabbat that "the building is suitable for children with disabilities. Many funds and budgets have been invested to adapt it over the years, for access from A-Z. A few months ago, the mayor promised that he would take care of finding a suitable alternative structure, because he could not throw out over 100 children, but in practice the structure proposed was not suited to the needs of the disabled." The mother claimed that in the new structure, 19 classes of children with special needs will be housed in a 10-classroom building, after millions have been invested at the taxpayer's expense to make the original building accessible. "This is an urgent decision, without prior notice, that makes it impossible to cope with finding an appropriate educational institution for these children - that it is very difficult to find a suitable institution among a limited number of religious schools for special education," she said. MK Ilan Gilon (Meretz), the chairman of the Lobby for the Rights of Persons with Disabilities expressed shock at the municipality's action. "I was shocked to see Mayor Zeibert today, violating the court's decision yesterday, and it is the abuse of the weakest children in the education system," Gilon wrote in a letter to the Interior and Education Ministers. "I call upon you to intervene immediately in all your authority, in order to stop the offensive conduct of the mayor and to protect the rights and needs of the children of the Beit Shai school." Gilon concluded his appeal to the ministers. The Bnei Brak municipality could not be reached for comment.